Ohio teen Sami Stoner loves to run. But when a rare eye disease swiftly stole her vision, the tree-studded trails of cross country running became too dangerous to tackle. Stoner has Stargardt's disease -- a hereditary form of macular degeneration that causes irreversible blindness. At first, it seemed running would be yet another sacrifice for the 16-year-old, who will never be able to drive. But she found her way back into the race with a one-and-a-half-year-old golden retriever called Chloe. "When one door closes, another one opens," said Stoner, a high school junior in Lexington, Ohio. "Even if you have a disability or you don't think you can do something, there's almost always a way." Stoner met Chloe, a specially trained guide dog, in July at the Pilot Dogs facility in Columbus, Ohio. Tethered by a sturdy harness, the pair endured four weeks of intense training -- first walking and then running under close supervision. Stoner already loved dogs, having grown up with Charlie -- a yellow lab she got for her fifth birthday. But learning to trust one as a guide was different. "I've never bonded with even a person like that," said Stoner. "She knows she has to watch out for me. I can't imagine being without her now." Stoner returned to Lexington with Chloe on Aug. 17 -- a bittersweet homecoming the day after 11-year-old Charlie passed away. 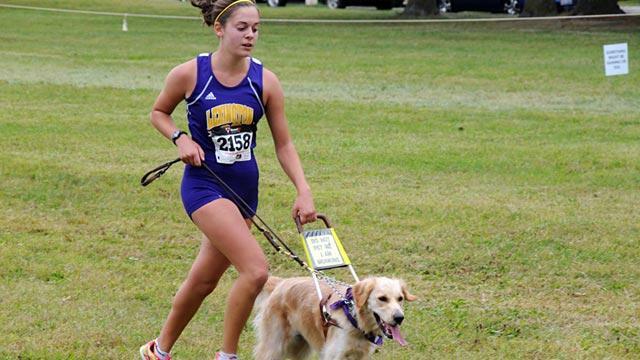 Although Chloe could safely guide Stoner through three miles of uneven terrain, one obstacle required outside help: Ohio High School Athletic Association rules barred Stoner from participating in cross country runs with a dog. "There's never been a blind athlete with a dog sanctioned to compete," said John Harris, director of athletics for Lexington Local Schools. Harris urged the association to allow Stoner and Chloe to run. Eventually, they said yes -- with some stipulations. Stoner has to start 20 seconds after the other runners. And while she's allowed to pass them, and she does, she can't impede them. With the Association's OK, Stoner and Chloe raced the following day on Sept. 17. In three meets since, the pair wearing purple bibs with the number 507 has bettered their time. "We had to make Chloe her own little jersey because she's a runner too," Stoner said. Chloe knows she's part of the Lexington team, rising up on her hind legs and barking during pre-race cheers. But when guiding Stoner through a bumpy trail or a busy street, she's all business. The cross country meets are exciting for Stoner, but emotional for her parents, Keith and Lisa. "There are a lot of things you hope for your kids, and one of them is that they get to see things," said Keith Stoner, father of three girls. "But she probably has the best outlook on life that you can imagine." Although she still has some peripheral vision, Stoner relies on special aids in the classroom, including an iPad. But despite Stargardt's, Stoner's grades are still up and her race times keep going down -- a trend her teachers and coaches are sure will continue. "In the beginning, the number one priority was just for her to be safe," said Denise Benson, coach of the Lexington varsity cross country team. "Now we're working on getting her to let her guard down and increase her stride." Stoner said she loves running because it's relaxing. "It's one of those things where you don't have to think too hard; you just put one foot in front of the other," she said. But people who know her say, "That's just Sami." "She has always had the attitude that somehow everything's going to work out," said Anne Petri, junior varsity coach and Stoner's teacher during her diagnosis. "She just takes it one step, one problem at a time." Stoner said she plans to keep running and go to college after high school -- with Chloe, of course. "She's given me a lot more confidence, not only my running but everything," she said. The trailblazer's message for others faced with limitations: "If you care enough about it, just try to find a way to do it, because I bet there is a way."